Moharram The Frst Month of Islamic Calendar Brings Along With It A Feeling Of Great Sadness And Sorrow In The Heart Of Every Muslim. It Is A Month In Which We Commemorate Imam Huseein (A.S) Victory In Martyrdom A Victory Which Has Permanently Preserved The True Islam Till The Day Of Judgment Whoever you are and whether you know me or not, we share a common bond that not only unites us, but also makes us close friends. You have begun your new year just as I have - by putting away all the happiness in your life and inviting in grief and sorrow with open arms. And we have done this along with tens of millions around the world. With Muharram, once again the cycle of life begins. Newly married couples forget their still-fresh happiness and replace it with mourning for the women who were widowed in Karbala, mothers teach their babies to raise their hands in matam and say the words 'Ya Husayn', fathers push their sons forward to carry the alam of Hazrat Abbas (a) in the hope that they too will learn the unshakeable loyalty that he had for Islam and his Imam. At least, that's what I hope is happening in every aza-khana around the world. Every year, I KNOW that the message of Imam Husayn (a) is spreading further and sinking deeper into the hearts of the Mo'mineen. And yet, every year, I feel like I have done that bit less than I should have in my azadari. I feel responsible for not upholding the azadari and keeping it vibrantly alive and then I think: "Who am I to think that I can have any effect on the life of the mourning of Imam Husayn (a) when the true source fuelling it is the du'a of Bibi Fatimah (a)?" I am after all, only a beneficiary of the energy exuded by the acceptance of that du'a. And still the guilt remains. Why the conflict? I wish I knew. It's a difficult task trying to balance hope and fear. I look around and see children who no longer love majlis and matam as our parents taught us to, and I am afraid that I wont know how to teach my children that love. Have we lost the secret of how our parents passed down lessons to us without ever actually teaching them? I can remember days when we'd come to the imambada and sit in semi-darkened rooms, when talking during majlis was a 'crime' and the only thing to distract your attention was a handkerchief out of which you were allowed to make cradles and balls in endless cycles. And once the zakir began to relate the tragedies, even that was forbidden. 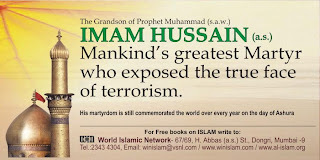 When the person of greatest importance in that imambada was the one who could cry for Husayn (a). Perhaps these are old-fashioned ways and have a place only in nostalgic monologues like this one, but I do know one thing without a doubt. The messages sent through these paths were unmistakeable. It was embedded in our hearts and minds that toys and food had no place while a majlis was being recited, and that when people mourned over Imam Husayn (a) you had to give all your attention to the pulpit regardless of whether you understood what was being said or not. And with time, the respect and love you developed became your teachers, and because you wanted so much to cry Real Tears like the grown-ups (and not just hide your face in your knees and secretly use your spit to draw wet, sticky streaks on your face) you learnt the language of the zakir even if it wasn't your mother tongue. I think this is one of the most basic miracles of majalis that we have taught ourselves to ignore. That people actually have learnt how to understand a foreign tongue despite the fact that they only hear it for ten days a year. For myself, I can find no reason except that I was first taught to hear the words with my heart, and my mind had no choice but to follow suit. Must we have majalis in Urdu or English? Of course not, but anyone who knows either of these languages will tell you that they make the pain sweeter, and grief greater. Yes, the world changes and we must move along with it. Yes, our times are not the times of our children and their children will have still different times. But we need to take stock as to how much we are losing in the process of change. Must change be a barter trade? Do we have to give up something in order get something? Not always. It's perfectly possible to retain what is good from the old and fix only that which is detrimental. If you're wondering when I'm going to get the solution, I don't have one - if I did, I wouldn't be writing this. But I do have a point to make, and here it is: For today, sit back and try and remember what Muharram was for you as a child. Then look around and see how much you have passed on to the next generation. Have you given them memories to treasure about the atmosphere of Muharram, as you were given by your elders? Will they see the crescent bow of the first day of every year and feel a bittersweet stabbing in their souls - as if they have once again reached that time when the very core of their being comes forth and responds to their Imam (a) on the plains of Karbala. Because if there is one lesson our grandparents taught us it was that our limbs were created to obey God, our voices to glorify Him, our souls to submit to Him and our hearts to cry for His Husayn(a) - that tears shed for other than Husayn (a) are wasted drops. Ahadith tell us that when our Imam (atfs) comes and the call to his army comes from the skies, only the true mo'mineen will hear it. A part of me believes that such a cry has been ringing across the earths and heavens since the moment Imam Husayn (a) called out on day of Ashura. It is this call that the hearts of the Shia respond to every Muharram. The question is: can your children hear that call?